Governor Andrew M. Cuomo today unveiled the design features of 1,025 new and reimagined subway cars – including vital enhancements to the exteriors and interiors of regular cars, wider doors, as well as the addition of up to 750 “Open Car End” designed-cars, which will reduce wait times and increase capacity. 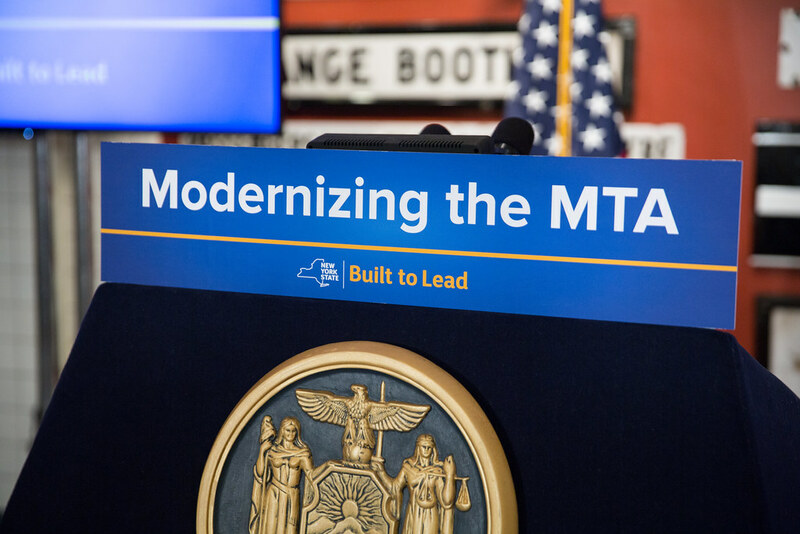 The Governor also previewed key elements that will be featured in the renovation of 31 subway stations throughout the New York Metropolitan Area, and announced that the first of several Requests for Proposals will be issued this week. The MTA is using design-build contracts to expedite the process and ensure the shortest timeframe for project completion. These vital investments are part of the $27 billion, five-year MTA Capital Program to renew and expand the MTA network. Governor Cuomo unveiled the ambitious design-plan at the Transit Museum in Brooklyn. Later this week, the MTA will issue an RFP for the construction of 1,025 new subway cars, which will highlight that the timeline of design and production, as well as cost-effectiveness, will be central factors in awarding the contract. Open Car End Design: The MTA anticipates that out of 1,025 new cars, up to 750 will feature an Open Car End designed. The Open Car End design replaces the door between cars with an accordion-like connector in order to create longer, open spaces, allowing for greater passenger flow movement and increasing capacity in the process. These cars have become an international standard: in London 31 percent of cars will be Open Car End by the end of the year; in Paris the figure climbs to 37 percent; and in Toronto to 56 percent. Wider Doors: The door width of the new cars will be expanded from the current MTA standard of 50 inches to 58 inches. Wider subway doors can reduce delays by allowing customers to enter and exit more quickly, and have become an international standard. According to a computer simulation of passenger flow conducted on behalf of the MTA, in crowded scenarios wider doors can reduce a train’s ‘dwell time’ in the station by 32 percent. Customer Amenities & Security: The interior of new cars will also feature a host of new amenities, including WiFi, USB chargers, full color digital customer information displays, digital advertisements, illuminated door opening alerts and security cameras to promote passenger safety. Exterior Features: Design elements for the exterior of the new subway cars include a new blue front with large windows, LED headlights, and a blue stripe with gold accents along the sides. Renovations will also consider the architectural legacy of each station, and remain sensitive to historical elements as the stations undergo redesign. RFPs for the remainder of the 31 stations will be released over the next twelve months, and will be distributed across the five boroughs. The first contract is expected to be awarded in the fall. Station closures will be limited to a six-month period. At the direction of the Governor, the MTA is using design-build contracts for all 31 stations. Design-build contracts call for a single team to be responsible for the design and construction of an entire project in order to ensure that coordination is seamless, and that work is completed in the shortest possible time frame. The MTA worked with distinguished and world-renowned design consultants, who hold extensive international design expertise in train and transit facilities, for its new rolling stock and station enhancements. The lead designer, Antenna Design, and engineering consultant, CH2M, have created the new subway car design. Lead designers, Grimshaw Architects, and Arup, program managers – both with offices in London and New York – spearheaded the stations’ initiative.